The trouble is, I'm only vitally interested in 1965-67 (apart from "The Narrow Way", which I love and the Waters' track "Granchester Meadows", the only time he got close to Syd and I think that's only because I come from Cambridge ). How many of you are planning on investing in the whole thing? ^ I won't be buying it. I have a lot of it. Not as good quality, I'm sure. 20 years ago I might have grabbed it. These days, I only wish I had the bucks to indulge in such a treat. Waters & Mason are talking about a Glastonbury reunion this year. If David Gilmour were to take the olive branch that has been extended, Nick Mason and Roger Waters said they’d reunite and play Glastonbury as Pink Floyd in the near future. Speaking at the opening of a new Pink Floyd exhibit in London, both Mason and Waters said they’d consider playing the British music festival with Gilmour. But even if Gilmour agreed and they performed together, I wouldn't think of it as vintage Pink Floyd without Rick Wright. As I've said before (in this thread and elsewhere), Rick Wright was to Pink Floyd what George Harrison was to the Beatles. Finally, a fresh, lush, (young at heart and) sophisticated, current, giant musical production. It was worth the wait, an album for an era. Album Review: Roger Waters - Is This The Life We Really Want? 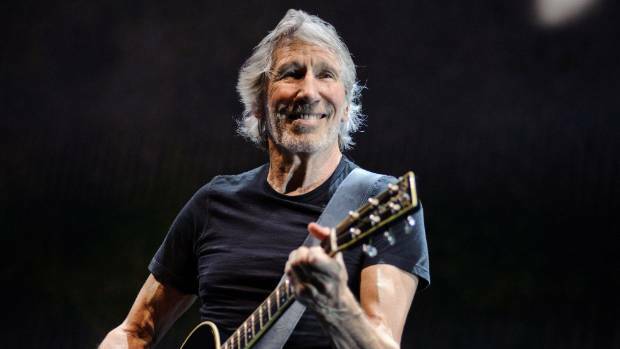 Never exactly a cheeky chappy during his decades fronting Pink Floyd, on his first record in 25 years Roger Waters is straight-up incandescent. He lashes out at the weaknesses in the democratic system that swept a “nincompoop” into the White House and blames human-kind in general for the decline in the standards of our leaders (we are, after all, the ones voting them into power). But if the record’s anger and tendency towards diatribe suggest a Twitter rant extended over 75 minutes, there is still lots to delight Floyd fans. With Radiohead producer Nigel Godrich behind the sound desk, Waters conjures a stoic grandeur instantly familiar to anyone raised on Dark Side of the Moon and, in particular, The Wall — a project likewise obsessed with inter-generational tension and political incompetence. 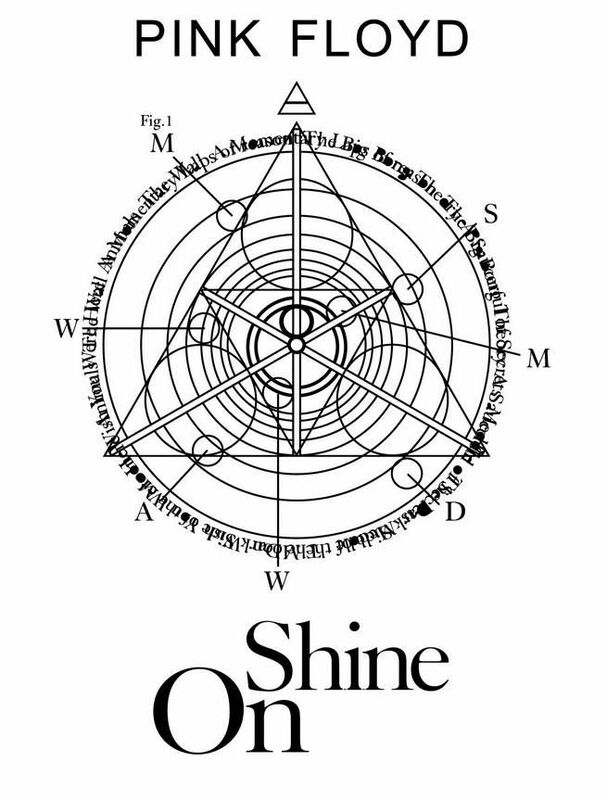 Orchestral swells underpin his careworn yelp as Godrich weaves in eerie found-sounds: squalling gulls, distorted radio broadcasts, the communiqués from pilots on bombing runs over the Middle East. Waters is further assisted by Jonathan Wilson, delivering David Gilmour-esque walls of guitar angst, and indie girl-duo Lucius, whose sad-siren backing vocals recall the ghostly ululations of Clare Torry on ‘The Great Gig in the Sky’. What’s changed is that the singer is now confronting real-world traumas head on. ‘The Last Refugee’ is a funereal rumination on what it must feel like for those fleeing Syria across the Mediterranean; on ‘Part Of Me Died’ he pours his rancour over Trump into a stately rock-out. A Floyd-esque concept record inspired by yesterday’s most bruising headlines, Is This The Life We Really Want? at times feels like a nostalgia-wallow. Far from mellowing, with age Waters has turned increasingly cantankerousness and preachy. But if you can bare to be lectured on the evils of drone strikes and the stupidity of the Trump administration (thanks Roger, but we already received the memo on that) the Floyd-esque touches make this worth delving into. Amid the sourness and dourness, are glimmerings of the old Floyd majesty and of Waters’ singular talent for blending the confessional and the universal. Roger for lyrics and ideas....musically he is weaker and needs someone like David (and Rick) to flesh his musical ideas out. David for music and melody...lyrically he is generally only average at best. Same with Polly. Added note...Syd for out-of-the-box-left-field-not-many-others-would-have-thought-of-this musical explorations and songs. Sometimes I think had he not cracked he and Roger could have been another Lennon and McCartney, Jagger Richards kind of team with David a very strong kind of George Harrison figure. But we will never know. Love the Floyd....less so the solo efforts of any of them except maybe Syd but due to his state they could have been better. 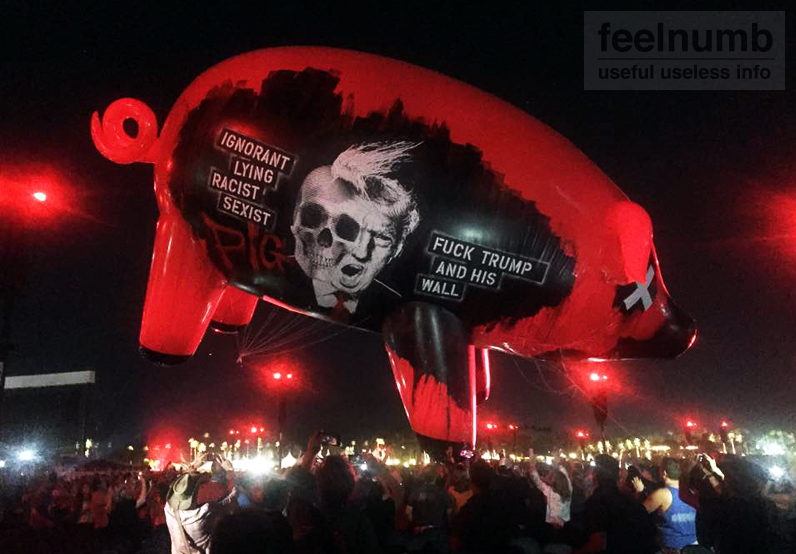 (CNN) An inflatable pig with Donald Trump's face on the side. Screens that show doctored images of the President throwing up. Photos of Trump with Russian President Vladimir Putin, as a big baby, and as Hitler. 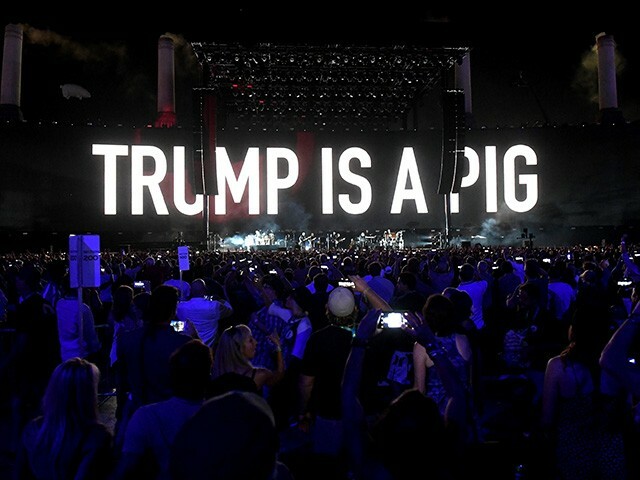 They're just a few of the images music fans can catch on Pink Floyd co-founder Roger Waters' 54-date North American tour, "Us + Them," which kicked off on May 26 and coincides with the release of Water's first studio album in 25 years, "Is This the Life We Really Want?" The political nature of his show, Waters told CNN, is a calculated and defiant response to what he calls the "charade" of the American presidency. ^^^I saw the show in Sacramento. I didn't see any signs of a conservative backlash. I knew what to expect as I had seen the Mexico City performance from last fall on YouTube. 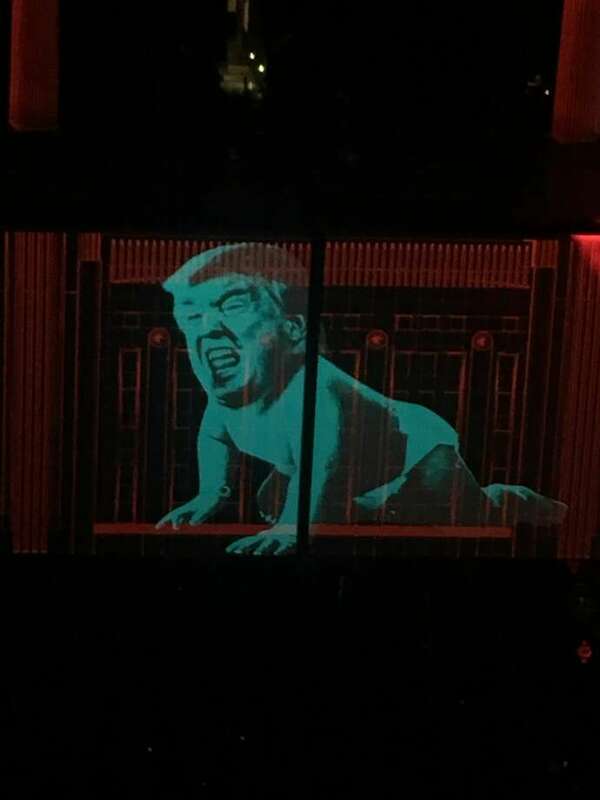 I knew what to expect because it's Roger Waters. Lorde, if you're listening, Roger Waters really, really wants to catch up. REVIEW: Lorde, if you're listening, Roger Waters really, really wants to catch up. The irascible master of theatrical rock had just left Spark Arena spellbound with an overwhelming, four dimensional cinematic display - accompanied by one of music's great back catalogues. After an overtly political show, Waters promised not to make any long rambling statements. "What a better world this would be with out nuclear weapons," he says. But he couldn't resist a shout out to a 'very special young lady' - and let slip he'd been trying unsuccessfully to get in touch. "I can't let this chance go by without a hat tip to one of your musicians... who stood up for... the Palestinian people," he says. "I'm really proud of her and if anyone knows her tell her to come to one of the gigs. You're a strong brave woman and I admire you." It was almost 30 years ago to the day that Pink Floyd played to 80 - or maybe even 90 - thousand people at Western Springs, depending on who you believe. Waters wasn't there that day due to a legal spat with the other band members - but on Wednesday night he brought all of Floyd's bombast to an all-seated Spark Arena. The evening begins with a 20 minute, meditative piece of music set against the backdrop of a woman with her back turned, sitting at the beach. Once Waters and his band take the stage, they launch into a battery of Floyd classics, including Time, The Great Gig in the Sky, and Welcome to the Machine. The familiar thud of Waters' bass sets the tone for a few long instrumental jams around new tracks such as Deja Vu and Picture That, where he implores listeners to "picture prosthetics in Afghanistan". The 74-year-old activist's anger with the state of the world is obvious. 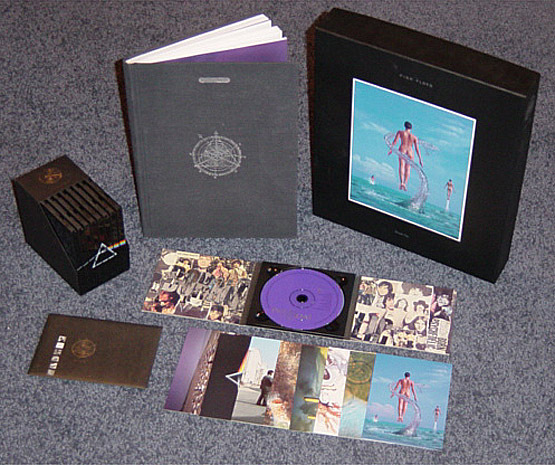 Waters has stated he doesn't listen to other people's music, and it shows in the lyrical and melodic styling of his new tracks, which heavily reference earlier Floyd work. But it's the classics that everyone has come to listen to, and Waters doesn't disappoint, launching into Wish You Were Here - sung by his 'Gilmour' Jonathan Wilson. As the familiar guitar riff of Another Brick in the Wall begins, a troupe of small hooded figures in orange jumpsuits traipse on stage. The Guantanamo eleven rip off their hoods to reveal the bodies of young children wearing T shirts with the word 'Resist' - a common theme for the evening. After a 20 minute intermission - who else but Waters would have one of those? - we return to find London's Battersea Power Station arising from the middle of the arena as giant screens bisect the crowd. With most of the crowd cut off, and only part of the band and stage visible, there's not much you can do but sit back and enjoy this extraordinary visual art installation. Then things get really interesting. Suddenly Donald Trump is everywhere. There's his face on a pig, as a white supremacist, and in an increasingly grotesque series of images. It becomes clear this is a deeply personal vendetta for Waters. The band don pig masks of their own and clink champagne flutes. And soon enough, of course, an enormous flying pig emerges. "God bless German engineering," Waters says of his giant inflatables, "not that there is a God". 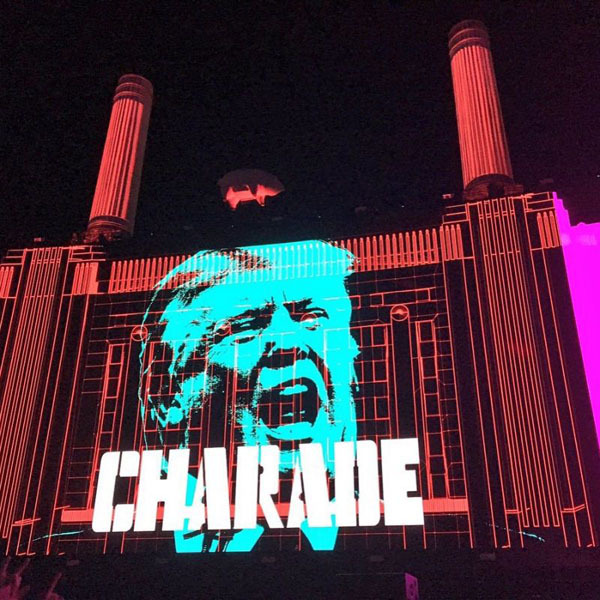 The stage show keeps evolving throughout, the giant screens withdrawn to reveal cathedrals of light for an epic finale of some of Floyd's best-known tunes. "This is the start of a long summer for us," Waters says, before listing all of the destinations his seemingly endless Us+ Them Tour would reach before he'd see another winter. His feelings for Lorde aside, the Waters clearly still loves the adulation, and seems to have a genuine affection for New Zealand and its anti-nuclear stance. "What a better world this would be with out nuclear weapons," he says. The messaging at times might at times seem a little heavy handed but when you're the ex-co-front man of Pink Floyd there are plenty of converted to preach to. And when it's over, all in all you're left anything but comfortably numb. 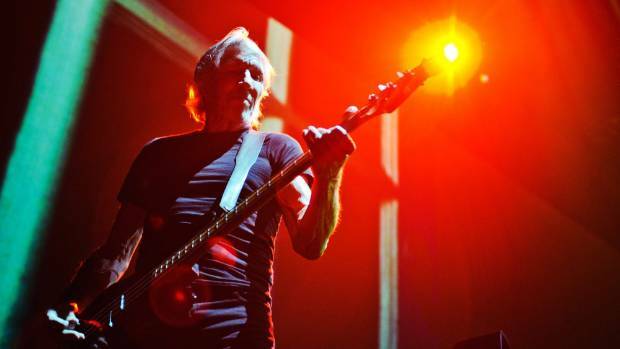 * Roger Waters plays a second show at Auckland's Spark Arena on January 26 and then in Dunedin on January 30. Just bought RW's latest album. It's not bad. I am not familiar with it but he did some of his solo stuff I am sure music from that album was included and everything sounded good. Sunday the 17th show just added!